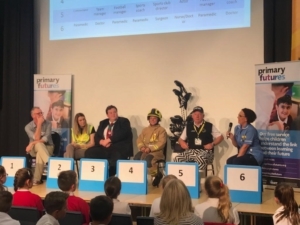 Primary Futures was delighted to launch Inspiring Goole yesterday with a special event. We were joined by inspirational volunteers from local businesses and organisations in Goole, who inspired children from eight local primaries to broaden their horizons. Children joined us from Airmyn Park Primary School, Boothferry Primary, Swinefleet Primary, Kingsway Primary, Hook Church of England Voluntary Controlled Primary School, Marshlands Primary, St Joseph’s Catholic Primary and Parkside Primary. At this special launch event children had the opportunity to meet with volunteers from a vast array of different sectors, jobs and organisations. To name a few, among the volunteers was a fire fighter, a nurse, a digital marketing manager, a professional golfer, the Deputy Mayor of Goole and a radio presenter, as well as staff from local employers, such as the local council and the Sewell Group. The morning kicked off with our signature What’s my Line? 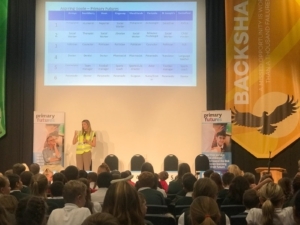 assembly which saw the children ask six volunteers questions about their jobs, and then attempt to guess what it is they do. This event marks the start of a campaign to inspire the children of Goole which will see several primary schools run their own events using Primary Futures volunteers, broadening horizons and helping children make the link between their lessons and their futures. Goole has sadly been classed for many years as a social priority area. The Primary Futures programme run by Education and Employers in partnership with the National Association of Head Teachers, endeavours to raise aspirations and improve outcomes, enabling every child to achieve their best regardless of background, vulnerability or disadvantage. We will be working with primary schools across Goole, to help raise prospects for the young people in the area by raising their aspirations and helping them to see the many opportunities that are open for all of them to attain. Over 3,440 primary schools across the country are registered with Primary Futures and in a recent survey, the charity found that 90% of teachers believe employer engagement has an impact on young people’s academic achievement. If you would like to start using Primary Futures to invite volunteers from the world of work to raise your classes’ aspirations sign up at the top of the page.